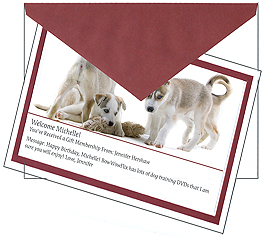 Gift Memberships make an Excellent Gift Idea for the fellow DOG LOVER! All certificates are custom printed on high quality card stock paper and include a personalized message! 1). You select and choose the plan you want. Our plan prices (from 1 - 4 DVD discs at a time) are the same as regular Membership pricing, except you get to choose how long the gift membership period will last. (we currently have plans for 1 month, 3 months, 6 months, and 1 year). 2). You enter a personalized message for the recipient. 3). You pay for the plan of your choice (one time only purchase). 4). We ship a gorgous gift card (similar to the photo shown above) to the recipient with your personalized message and include easy and clear instructions to the recipient on how to redeem the gift membership along with their Gift Membership redemption code. 5). Once the recipient goes to our web site, there is a "redeem gift" link at the top of our page. When the recipient clicks on that link, they are taken to a page to enter their gift redemption code. They then create an account and their Gift Membership is activated immediately and they can begin to rent DVDs! **Please note that ALL gift recipient's MUST have a valid credit card when they redeem their gift membership! They will NOT be billed during their gift period. This is just a safeguard in the event that the gift recipient fails to comply with the terms and conditions, such as not returning a DVD rental, or chooses to continue their membership after their gift period expires. To purchase a Gift Membership Certificate, click here!! The Largest Source of Dog Training DVD rentals on the Internet, Woof, Woof!